Oil on Cartulina sobre lienzo. While Albert Bierstadt is justly regarded as one of the greatest of the landscape painters of the American West, relatively little attention has been paid or recognition of his superb artistry awarded to his scenic depictions of other regions, both on the North American Continent and elsewhere. Outside of the United States, Bierstadt painted the landscape of Germany and Italy, early in his career, and later recorded spectacular scenery in Switzerland and Canada. In addition, he created a small but compelling body of work in the Bahamas, travelling there beginning in the late 1870s, as his wife, Rosalie, a victim of chronic consumption, regularly spent much of almost every year in the Bahamas, beginning in 1876. Bierstard was not the first North American painter to paint in these islands. The earliest professional artist to visit and work there appears to have been Louis Comfort Tiffany who, in 1869 visited Nassau and subsequently exhibited Bahama scenes in New York, Brooklyn, Chicago, and Pittsburgh between 1870-1872. The illustrator, Walter Yeager, produced a series of sketches to accompany the sequence of Bahama-related articles entitled "The Land of Sunshine" published in 1878 in the Frank Lislie's Illustrated Newspaper. Bierstadt and Winslow Homer, who made the two trips there in the winters of 1884-1885 and 1898-1899, each for a period of about three months, are the best-known painters to work in the islands during the last three decades of the century. While his wife was in Nassau almost every year for nearly two decades, sometimes accompanied by her sister, Esther Osborne, Bierstadt's appearances there are less well documented, and his correspondence with Rosalie confirms his activity elsewhere during much of the time she spent in the Bahamas. The artist had certainly joined her there as early April of 1877, and spent a month in Nassau from mid-March to late April 1878. He is know to have returned as late as 1892, but given the artist's alternative travels and commitments, these may have been his principal, and perhaps his only visits. Bierstadt produced at least one monumental Bahama scene, The Shore of the Turquoise Sea (Manoogian Collection), which he completed early in 1878. Bierstadt painted a number of smaller views in the Bahamas, including a panoramic View of Nassau, the Bahamas (formerly, New York, Alexander Gallery), seen from on high. In addition, a number of Bierstadt's finished oil studies painted in Nassau are known; undated, they might have been painted on any of the artist's trips to the Bahamas. As early as the fall of 1877 a visitor to the artist's New York studio reported on a View of Nassau Light and other Bahama scenes. Though somewhat reminiscent of Bierstadt's oil sketches of Southern Italy an the beach at Capri painted in the late 1850s, these pictures otherwise differ substantially from most of the rest of the artist's works. In place of a concern with the natural sublime, Bierstadt investigated and captured the appearance of the town and landscape of Nassau and the lively activities of the local inhabitants, recorded in brilliant colours and suffused in warm sunlight. One of these is his Nassau Harbour (San Francisco, Fine Arts Museums of San Francisco), depicting a number of young man on the beach, one with a small horse, and a panoply of vessels, both steam and sail, in the harbour, from local fishing and sponge boats to larger steamers. The present work, Street in Nassau, complements the harbour scene, an interior view in which a long, straight rolling thoroughfare leads the viewer back a great distance. In Street in Nassau, numerous local folk walk along the roadway, hatted to shield out the host sun, and keeping to the more shaded side of the road with is lined by overhanging trees. In fact, it may well be that the scene can be identified specifically as the road from Nassau to Grantstown, the more populated of the two outlying communities where the Black population resided. The road-way, a mile or two long, was described by Mrs. Lesley on 6 July 1878, as "consisting of one long street, so straight and level that the eye travels along it for a mile of more until the two lines of wavering palms and bananas border the street converge and blend into a charming vista." Bierstadt here appears to contrast the solid stone wall in the left foreground, with its pillared entranceway to what must be a substantial, white-owned plantation home, with a distant view of the community housing the small dwellings of the Black population which dot the middle distance. But while this inevitably implies the economic contrast between the wealthy land owners and the local Black population, there is little emphasis here upon social distinctions. 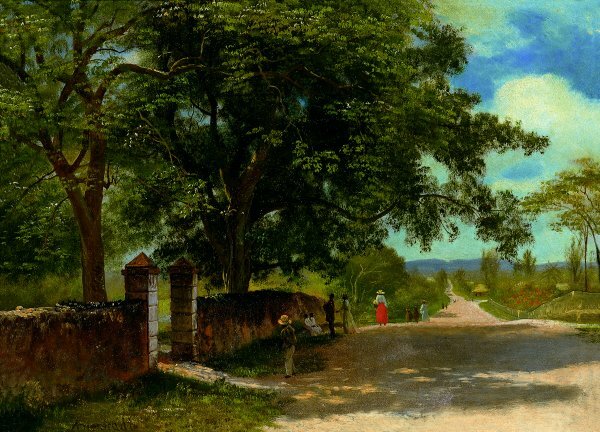 Rather, Bierstadt concentrates upon the natural environment, accentuating the warm, clear sunlight reflected in the roadway, contrasted with the soft shadow patterns cast by the trees. This is an inviting scene, the rolling road and the fleecy clouds projecting a sense of lethargic contentment, very distinct from the active view of Nassau Harbour which would seem almost a counterpart in contrast, although light, air, and the hot summer-like atmosphere are primary concerns in both paintings. It is possible that Street in Nassau may have been publicly displayed in Nassau in December of 1885 in the First Loan Exhibition, held in the Bahamas, even perhaps the first such show in all the West Indies, as reported onÂ December in The Nassau Guardian and Bahama Islands' Advocate and Intelligencer. While no catalogue for the exhibit is known, the newspaper singled out specifically for "the lover of art the exquisite sketches of Mr. Bierstadt, so kindly lent by Mrs. Bierstadt whom we welcome back to our shores." Otherwise, with the exception of The Shore of the Turquoise Sea and several variants of that picture, Bierstadt seems to have exhibited his Bahama paintings only occasionally. But as other of Bierstadt's Bahama oil studies surface, should they be equal in quality and reflect the natural scenic beauty projected by Street in Nassau, the Bahama scenes will prove an aspect of the eminent artist's work that deserves greater recognition.